Left to right: Eddie, Lily, Herman, Marilyn, and Grandpa. A Mundane Fantastic Dom Com that originally ran from 1964 to 1966 about a working class family of would-be monsters. Experienced surprising high ratings during the period before the Batman TV series came on, revolutionizing color TV. The humor of the series came from the odd juxtaposition of many "cartoon" antics in a live-action series, namely "Fast Motion", as well as the fact that despite their gothic appearance, the family doesn't seem to think they're different from anyone else, with the exception of cousin Marilyn who didn't inherit "The Family Look". Thanks to the aforementioned Batman, The Munsters had a short run, only airing 70 episodes over 2 seasons before being cancelled. However, the show found a large audience in syndication. NBC had optioned a reboot of the series created by Bryan Singer and Bryan Fuller entitled Mockingbird Lane, featuring Jerry O'Connell as Herman, Portia de Rossi as Lily, Eddie Izzard as Grandpa, Mason Cook as Eddie, and Charity Wakefield as Marilyn. Oh, and it was to be a drama. The pilot episode aired as a TV special on October 26, 2012, but NBC didn't pick it up. In August 2017, another reboot of the series attempt was announced. Herman, the 7-foot-tall Frankenstinian patriarch of the family. Though he believed himself to be a Standard '50s Father, he was really more of a Bumbling Dad and loveable idiot. Employed as a gravedigger for Gateman, Goodbury and Graves Funeral Parlor. Afraid of Blood. It is worth noting that Herman is considered to be the most successful of Doctor Frankenstein's many efforts - presumably since he didn't tear apart the countryside. Later, it was established that a British family named Munster had adopted Herman. Lily, the doting housewife with a faint resemblance to the Bride of Frankenstein. The child of immigrant parents, Lily was more keenly aware of social standards than the rest of her family, but nevertheless cheerily went about her bizarre habits anyway. Usually became involved to bail Herman and Grandpa out of trouble. She and Herman have one of TV's most successful marriages - during the series they celebrated their 100th Anniversary! Eddie, a boy with werewolf tendencies, Eddie had the typical problems of a pre-teen in 1950s America: too much homework, not enough television, can't stop chewing the teacher's leg, etc. Marilyn, the pretty blonde Unfazed Everyman of the series, Marilyn was the shockingly normal muggle niece of the family. Rather than proud of being able to conform better, Marilyn was convinced that she was the freak, and her aunt and uncle regarded her "weirdness" as a tragic affliction. Despite being ripe for storylines, Marilyn was a background character at best. Her (second) actress even said years after the fact that anyone could have played her. Grandpa, Herman's Lancer and usually the instigator for the show's zany scheme of the week. A combination Count Dracula and Mad Scientist, Grandpa was an Omnidisciplinary Scientist with at least one degree in Occult Magic. He sometimes reported being discriminated against by his neighbors — not because he was a blood-sucking demon of the night, but because he was European. Adaptation Dye-Job: Marilyn is a blonde in the series, however, in the movie Munster, Go Home!, she's a redhead (mainly because she was played by a different actress than the rest of the characters. Amusing Alien: The Munsters are funny because they never realize anyone finds their appearances or mannerisms bizzare. Animated Adaptation: The Mini-Munsters, a 1973 animated TV movie. Blind Without 'Em: Dr. Dudley. He even invokes it by taking off his glasses whenever he has to examine Herman so that he doesn't have to be frightened by his appearance. Broken Aesop: Eddie has a tendency to brag to the other kids about Herman's abilities, to the point of making them up. This often gets Herman in over his head as he tries to make good on his son's lies. Eddie is never punished for this. Bumbling Dad: Herman isn't very bright. Chinese Launderer: Herman finds a job working for one of these after being fired from the parlor. It doesn't last long. Chocolate-Frosted Sugar Bombs: The Munsters Today episode "A Hero Ain't Nothin' But a Cereal" had Herman being coerced into endorsing an unhealthy breakfast cereal called Licorice Puffs. In the end, he is encouraged by his family to tell the truth to the public that Licorice Puffs has no nutritional value whatsoever. Cool Car: The Munster Koach and the Dragula race car. The Munster Koach was arguably the show's signature. Note: The car used in Rob Zombie's Dragula music video is not the Dragula, but the Munster Koach. Cool House: The Munsters' house looks like your average old haunted house. Cute Monster Girl: Lily is a vampire, but very attractive. Darker and Edgier: Mockingbird Lane. Dark Is Not Evil: Herman, Lily, Grandpa, and Eddie are all monsters, but at the same time they are kindhearted and decent people. Deadpan Snarker: The Raven in the Clock. Also, Grandpa. Diet Episode: Herman tries to go on a diet when he's about to attend a reunion with his old army buddies, and discovers his old uniform no longer fits. By the end of the episode, he settles on wearing a girdle underneath. Everyone Has Standards: Turns up in The Munsters Today in the episode that is a remake of the original series' "Just Another Pretty Face". While the original version had the doctor refuse to surgically restore Herman's Frankenstein monster appearance after he became human, the Munsters Today version of the episode has him agree to do the operation, but Herman and Lily are disturbed with how eager he is to do it, so they back out if it. Expository Theme Tune: The theme song to the first season of The Munsters Today explains that the Munsters from the original 1960's series "went to sleep many years ago" and "woke up with a brand new show". 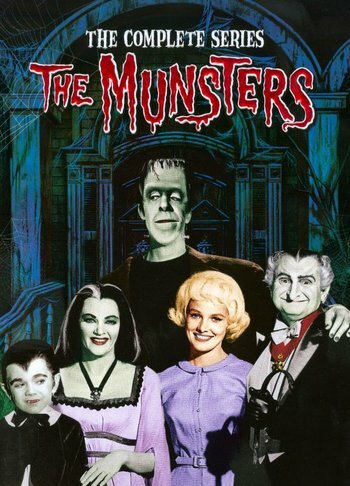 Since the rest of the series ignored the premise of the Munsters from the original show ending up in the late 1980's because of being put in suspended animation, the theme song for the other seasons became an instrumental. Extremely Dusty Home: The family lives in an old house with lots of cobwebs. Face of a Thug: They look like stock Gothic Horror monsters but hold no ill will toward anyone. Fantasy Kitchen Sink: Frankenstein monster, vampires, and a werewolf...all related! Fast-Forward Gag: Whenever someone meets the Munsters and runs away. Fish out of Temporal Water: The Munsters initially became this in The Munsters Today, where it was established that they accidentally went into suspended animation for over 20 years and now had to catch up with the culture of the late 1980's. The premise only stays consistent in the first season, however, as the other two seasons act as if the suspended animation accident never happened. While the show's theme is an instrumental, there were lyrics written for it that were never used. Zig-zagged with The Munsters Today. In the first season, the theme song had a few lyrics explaining the show's premise, but the rest of the series changed it to an instrumental, most likely because of the show's changes causing the first season's theme song to become meaningless. Fluffy the Terrible: Spot The Dragon. as well as the Black Cat who roars like a lion. Friendly Neighborhood Vampire: Grandpa and Lily are both very friendly to their neighbors. Gentle Giant: Herman may be a tall Frankenstein monster, but he's really a big softy. Happily Married: Herman and Lily. The first (live-action) couple to be shown sharing the same bed. The first couple was Fred & Wilma Flintstone. Hiccup Hijinks: Herman gets the hiccups in the beginning of one episode, causing the whole house to shake. Grandpa cures them early on, but by the end of the episode, they come back. Hollywood Natives: While on vacation, Herman is separated from the rest of the family, and stumbles onto a tourist attraction that is a show business tribe. Although most everyone is an actor dressed up as and acting like a Hollywood Native, the tribe somehow has an actual Native American Chief who is so old and delusional, that he believes his tribe is real, and even attempts to marry Herman to his daughter. Housewife: Lily normally doesn't have a job. Impact Silhouette: Frequently happens whenever Herman crashes through a wall. He also does this with the front door during the opening theme for the second season. Improbably Cool Car: The Munsters Koach and Grandpa's coffin-mobile. It was the '60s, it was a high-concept sitcom, so of course they had to have George Barris showrods even though it's never explained how a working stiff like Herman can afford a car like that. Injury Bookend: In one episode Herman gets struck by lightning and is turned into a regular human being. After all of Grampa's magic fails to return him, he gets struck by lightning again and is back to his old self again. I Want You to Meet an Old Friend of Mine: Previously, Fred Gwynne and Al Lewis were featured in the series Car 54, Where Are You?. In the movie Munster Go Home! Herman panics telling Grandpa to "Call the police! Call the FBI! Call Scotland Yard! Call Batman!" And then shouts out, calling "Car 54, Where Are You?!!!!!" Jackass Genie: One pays the family a visit in The Munsters Today episode "Genie from Hell". One example of his antics was that he gave the teenage Eddie a toy car when he wanted a real one. Jekyll & Hyde: Inverted. In Here Come the Munsters, Marilyn is the daughter of Herman's sister Elsa and a mad scientist named Norman Hyde. A major part of the film's plot is that while trying to find a way to make Marilyn more pleasant-looking by the family's standards, he accidentally turns himself into a handsome man named Brent Jekyll. Brent Jekyll is used as a puppet by a racist politician to deport all immigrants in America, but Grandpa manages to turn Jekyll back into Hyde before it is too late. Jerkass: The two elves in The Munsters' Scary Little Christmas, though they do get called out for trying to ruin Christmas just so they can have a vacation and also make amends by inventing a machine that creates toys from a person's thoughts (Herman's). Lightning Can Do Anything: Like turn Herman into a normal human. Or change Herman back into a man. See Sexophone below. Locked in a Freezer: in one episode, Herman and Grandpa get locked in a bank vault when they try to return some money that they accidentally stole (Herman having been mistaken for a bank robber earlier in the episode). Fortunately for them, the real robbers show up and blow open the vault, after which they pass out in fright when Herman and Grandpa step out to thank them for the rescue. Manchild: Herman. One of the Running Gags was him throwing foundation-shaking temper tantrums. In addition, he also enjoys watching children's programs, was once coaxed into testing Grandpa's sleeping pill by being promised candy, and his biggest concern about getting people angry is that they will yell at him. Mistaken for Murderer: The Munsters Today episode "Drac the Ripper" had Herman Munster see a police sketch of Jack the Ripper on a television news bulletin. He notices Grandpa's likeness to the drawing and becomes suspicious that Grandpa is Jack the Ripper. Monster Mash: Another difference from the Addams Family who were general gothic, while the Munsters were based on specific movie monsters. The Wolfman shows up in one episode - as Lily's brother Lester. The Creature from the Black Lagoon shows up too, he's from the old country, rich and used to be a politician as well. He's called Uncle Gilbert. Igor (the hunchback) showed up in the Reunion movie as distant cousin/Grandpa's old lab assistant. The Phantom of the Opera was also in the Reunion movie as "Cousin Phantom". The Movie: Several, but only two...the theatrical Munsters Go Home! and the tv movie Munsters' Revenge... featuring the original actors. Mythology Gag: In The Munsters Today episode "Designing Munsters", Herman and Lily exchange roles as provider and housewife. A montage is shown where the opening credits of the original show's first season is reinacted, but with Herman and Lily switching roles: Herman kisses Lily while giving her her suitcase, scolds Grandpa for trying to bite him, kisses Marilyn when she leaves for school, and gives Eddie his books and pats his cheeks. Here Come the Munsters and The Munsters' Scary Little Christmas both featured a nod to the 1981 film The Munsters' Revenge. The former had Herman getting arrested as part of the plot and the latter featured the Phantom of the Opera as one of the Munsters' relatives. Negative Continuity: The Munsters Today was originally meant to be a sequel series to the original show where the Munsters had been frozen for 22 years and woke up in the late 80's, but by the second season inconsistencies become so blatant that the show started to gradually become an Alternate Continuity. As noted in the above mentioned Jekyll & Hyde, the original series establishes that Marilyn is the daughter of Lily's sister instead of Herman's. Not Allowed to Grow Up: Averted in The Munsters Today. By the second season, Eddie becomes a teenager. Not-So-Imaginary Friend: In one episode, Herman befriends a young boy named Galen after rescuing him when gets his head stuck in a fence, but his parents don't believe him when he tells them about "Uncle Herman", so they send him to a psychiatrist. Galen ends up taking the psychiatrist to the Munsters' house to prove that Herman is real. Hilarity Ensues. Obliviously Beautiful: Marilyn Munster, as a consequence of believing her family's standards of beauty. Only Child Syndrome: Eddie Munster is an only child, in spite of his parents having been married over one hundred years. Only Sane Man: Even though he was more or less Dracula incarnate, Grandpa wasn't really as naive as the rest of the clan. Our Werewolves Are Different: Eddie has pointy ears and a widow's peak, but barely anything else about him that's wolf-like. Our Vampires Are Different: Lily and Grandpa eat the same things as everybody else (including turkey at Thanksgiving). They usually sleep at night, Lily even sleeping aside Herman in an ordinary bed. Probably no fangs, and they have normal reflections nor any weakness to garlic or crosses. Lily and Grandpa have just been alive . . . or not dead . . .for a long, long time. Grandpa does has a taste for blood, given his attempt to bite Lily's hand in the first season opening. However, in America at least, Lily seems to view such things as inappropriate. In one episode, Grandpa telephones "the old country" and ends up with a switchboard operator whose mother he had bitten once, vampires tyle. The two briefly chat happily about the vampire bite in the same way a person might talk about having dated someone's mother, with the implication that the switchboard operator's mother had been flattered that a celebrity vampire like Dracula (i.e. Grandpa) had bitten her once. The Munsters Today had quite a lot of these, one example being in an episode where Herman mentions hearing music and giggling in Dr. Frankenstein's lab nine months before his younger brother Frank was created. The Munsters' Scary Little Christmas also has some, one being when the two elves that try to cancel Christmas for their own selfish reasons excitedly talk about surgically-enhanced supermodels and then chant "Silicon, silicon". Revival: The 1980s series The Munsters Today and a revival movie from the 90s. Worth noting that The Munsters Today, despite being a show whose premise was that the Munsters were cryogenically frozen and woke up in the '80s, lasted longer than the original show. Mockingbird Lane was originally envisioned as this, before NBC later aired the pilot as a Halloween special (and later scrapped the idea altogether). Real After All: In "If a Martian Answers, Hang Up", Herman mistakenly thinks he's contacted extraterrestrials via radio. At the end of the episode, a real alien does call in and is rudely rebuffed. Rearrange the Song: The theme song of The Munsters Today is a hard rock version of the original series' theme, which even had lyrics in the first season. Running Gag: Any time Herman gazes into a mirror, it cracks. Sequel Series: The Munsters Today was initially this with the premise that the family from the original 1960's series were in suspended animation for 22 years and woke up in the late 80's, but by the second season this backstory was contradicted enough times that the show became an Alternate Continuity. Sexophone: Used when Grandpa's latest invention turns Herman into a woman. (He got changed back by the end of the episode). Grandpa's spell once did the same to Eddie at the end of an episode, so the reset was automatic. Butch Patrick's 1983 novelty single "Whatever Happened to Eddie?" is set to the tune of the theme song and details his life as Eddie Munster. Marilyn, of course, is a reference to Marilyn Monroe. Munsters Go Home includes shout outs to Car 54, Where Are You? (in which both Fred Gwynne and Al Lewis starred) and to the 1966 Batman series. Because both series were produced by Joe Connelly and Bob Mosher, there were several nods and references to Leave It to Beaver, including one episode where Herman is unsuccessful at using reverse psychology to talk Eddie out of running away from home (which was a plot in an earlier Leave It to Beaver episode), much to Lily's chagrin. In one episode, Herman gets wrapped up in an insurance scam, where the scam artists convince the mark he's starring in an action film, then injure him with dangerous stunts and collect the accident insurance. The film is called Double Indemnity. Siblings Wanted: In "Eddie's Brother", Eddie, suffering from Only Child Syndrome, tells his parents he wants a little brother. Herman and Lily both faint. Signature Laugh: Herman's braying bellow. Sleeping Single: Subverted. Then again these Munsters are strange folk. Take That! : Two episodes of The Munsters Today took a shot at the film adaptation of Howard the Duck by saying that watching it twice is very undesirable. Teens Are Monsters: Averted literally— Marilyn Munster is the only normal person in the family. "Poor dear... it's not her fault she's so ugly." Kind of a Fridge Brilliance Aesop to some kids about beauty being subjective. Lampshaded when a TV Land Channel Commercial was showing reruns of the show, their promotions added (less than masterful) lyrics to the theme song, including the line, "Marilyn, you're normal, where the heck did you come from?" Thanksgiving Episode: The episode "Low-Cal Munster" happens specifically on Thanksgiving. The episode, though, aired during October. 13 Is Unlucky: The Munsters live at 1313 Mockingbird Lane. This Is My Side: Grandpa and Herman had many childish antics like this. The Tonsillitis Episode: Eddie in "Operation: Herman." Took a Level in Dumbass: Herman in The Munsters Today. Took a Level in Jerkass: Grandpa tends to be more insulting towards Herman in The Munsters Today. "Where? Where? ": The early episode "Walk on the Mild Side" has Herman suffering from insomnia and going for late-night walks in the park, and the rest of the family worries for him because of a rash of monster sightings in that very same park. Nobody in the family ever realized that Herman was the monster everyone else was reporting. White Sheep: Marilyn was this the rest of her family. Interestingly enough, only physically. She finds the macabre and creepy monster lifestyle just as appealing as any other member of the family.